TAI Gallery in Santa Fe, New Mexico is pleased to announce the two-artist show of new artwork by Yamaguchi Ryuun and Kibe Seiho August 7 through August 15, 2009. Driven by the fire of their creativity, both artists make artwork true to their individual visions, winning many awards in Japan and having work in many collections here in the U.S. 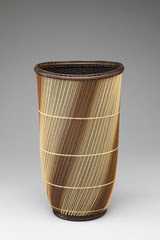 If you are not familiar with Japanese bamboo art, be certain to visit the TAI Gallery's presentation of Techniques of The Masters of Japanese Bamboo Basketry to learn more about this complex art form. Visit BasketMakers.com for even more about bamboo baskets, weave patterns, growing habits of bamboo, bamboo museums, bamboo basketry techniques, basketmaking supplies with sources for a wide range of bamboo species used in basketweaving. i am exactly from the bamboo home decor , i must say that such bamboo art are really cool and amazing!